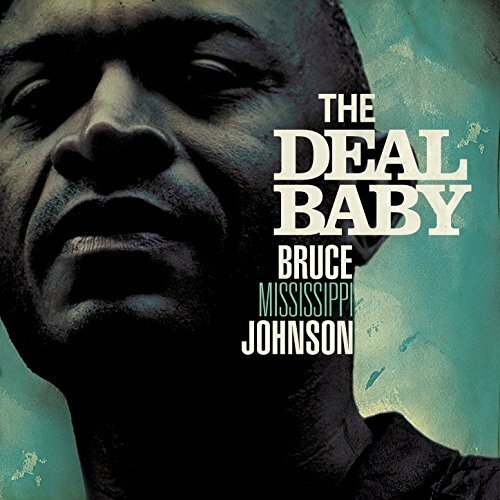 From the moment that you hit play there’s something different about The Deal Baby, the debut album from the Starkville born singer Bruce ‘Mississippi’ Johnson. It may open with the deltafied sound of a bottleneck on a steel string, but it’s clear that this isn’t going to be a throwback to tradition as the electric piano cuts in with soul influenced chords. Over that Bruce intones, in his distinctive, rich, bass baritone that “Blues is love and love is the blues,” and you’re set up for an unusual but deeply satisfying listening experience. The journey continue hues through a selection of tunes that owe a debt to soul and funk as well as the blues that you expect, sounding at once vintage and modern. There a grainy compressed edge to the electric rhythm guitar that could have come straight from STAX and the keyboards (played by the co-writer of many of the tracks, Johan) have a bounce that wouldn’t be surprising to hear on a 70s funk record. Bass and drums are tight and grooving with the kind of push that gets into the base of your spine and makes your hips move, and while they have a more modern sound than the rest of the band it isn’t incongruous, blending perfectly with the rest of the band to provide a sound that’s at once familiar and yet new and refreshing. The main instrument here is, however, Bruce’s sonorous voice. It’s deep and rich, complex like a fine wine, and warm and satisfying like a good whiskey. There are similarities with his hero Gil Scott Heron, not just in his range but also in the heartfelt delivery and deeply personal lyrics. However, he’s no mere copyist, you won’t think of anyone else but Bruce as you listen, and with a voice such as his, moving and direct, you won’t want to. The songs that Bruce has written are deeply personal. Workin’ Mojo is, I’m assured, a true story based on a woman ineffective attempts to seduce him with charms bought from a voodoo shop. That’s The Deal, Baby is a somewhat tongue in cheek piece of advice for his partner to avoid the temptations of online shopping. The album really hits it’s emotional center point when it reaches See You Tomorrow. It’s a tragic tale, one that Bruce lived, of losing a lover unexpectedly and in the worst possible circumstance, and on it Bruce shines, there aren’t many people who could bring themselves to write a song this personally harrowing, and then to perform it with the simple honesty it deserves. This is an amazing album, a modern classic that takes it’s own path, away from the hard rock posturing that typifies so much of modern blues. It is a body of work that stands as a whole, a cohesive collection of songs that can captivate and surprise, and I’d urge all of you to take the time to listen.